Some words come loaded with meaning. For example, if you are under eighteen, you are a juvenile. How do you respond to that word? Do you like being called a juvenile? Probably not. I bet you’d prefer to be called an adolescent or a teenager. The definition of juvenile is “not fully grown or developed; young.” That’s pretty much the same as adolescent or teenager. So why don’t most young people like being referred to as juvenile? There at least two reasons. One is that another definition for the word juvenile is “marked by immaturity.” It doesn’t have to mean that, but the association is there. When we hear juvenile, we think “immature.” Another reason is that the expression “juvenile delinquent” is very common. So common, in fact, that many people confuse the terms and think juvenile means delinquent. Like it or not, the innocent definition of the word juvenile doesn’t change the emotional response we have to the word. What we are talking about here is the difference between denotation and connotation. Words have both. The denotation of a word is its literal dictionary definition. Its connotation, on the other hand, is the emotional strings that come attached to the word. Writers must be aware that words often communicate more than simply what their dictionary definitions indicate. Here’s another example: Would you rather be described as thin or skinny? There’s not much difference in definition, or denotation, but the connotation of thin is much more positive than skinny. Would you rather be small or petite? Attractive or beautiful? Handsome or cute? Smart or intelligent? Would you rather be fired or let go? It makes a difference. Certain job titles carry negative connotations, so we are constantly changing titles. Nobody works as a garbage man any more. He is a sanitation engineer. Janitors are called custodians or facilities maintenance directors. Bus drivers are transportation specialists. It can get a little silly. Think about all the terms we’ve invented to communicate the idea of dying. You might tell someone that your pet hamster “keeled over” or “croaked” or “bought the farm,” but you wouldn’t use any of those expressions in reference to a person you care about. For people who die, we use more gentle expressions like passed away, went home, or no longer with us. We refer to these gentler ways of saying things as euphemisms. The difference isn’t in the denotation, but the connotation. When you write, it is important to keep in mind both the denotation and the connotation of the words you use. 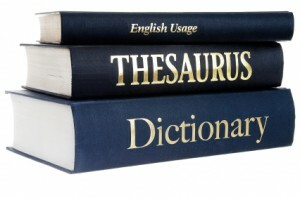 Be aware that there is more to what words mean than their dictionary definitions. Make a blogger’s day. Leave a comment. Or I can be precise and avoid confusion, like calling you a short, little, opinionated dude. Isn’t this much better?